SPURGEON BELIEVED that religion should be carried into politics. Spurgeon normally observed his own principles. Although politically partisan statements occasionally crept into his sermons, they were always defensible as pronouncements on moral issues that had caught the public eye. Outside the pulpit, however, he was willing to express his party views without reserve. Spurgeon was a political force. What was his party allegiance? Spurgeon was like almost all the English Baptists, Congregationalists, and Methodists of his day in supporting the Liberal Party. These denominations—the chief Nonconformist bodies— were excluded from the privileges of the Church of England. Nonconformists naturally favored reforms to reduce their handicaps, and their reforming sympathies aligned them with the Liberals. No professional group was more likely to vote Liberal than Nonconformist ministers. Spurgeon was advocating four great principles. First, he was protesting against the recent imperialistic ventures of a Conservative government; that was a stand for peace. Second, he was calling for measures of change that would benefit the common people; that was a commitment to reform. Third, he was urging religious equality, the distinctive aim of Nonconformists. Fourth, he was demanding a decrease in wasteful public spending; that was a recommendation of retrenchment. If religious equality is left aside for the moment, Spurgeon’s principles were peace, reform, and retrenchment. Those were the three campaigning watchwords of the Liberal Party under W. E. Gladstone. Spurgeon could hardly have been closer to the heart of Liberalism. Adding the distinctive Nonconformist principle, religious equality, put Spurgeon on the more advanced wing of the party. He was an outspoken champion of the disestablishment of the Church of England. Nonconformists, he insisted, must be allowed to enjoy all the advantages of Anglicans. They should be permitted, for example, to conduct their own burial services in parish graveyards. They should be able to take degrees at the ancient universities of Oxford and Cambridge. And the bond between church and state must be severed, as it had been in the United States. 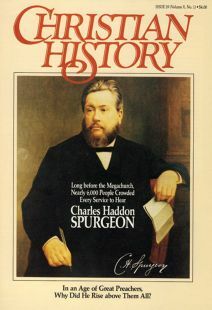 Spurgeon was for many years a prominent member of the Liberation Society, a pressure group aiming for disestablishment. In fact, his church, the Metropolitan Tabernacle, was regularly used for the society’s annual meeting. In his later years, however, Spurgeon became dismayed that freethinkers were also prominent in the society. In 1891 he decided to discontinue his subscription. “We will not,” he wrote, “by this question be brought into apparent union with those from whom we differ in the very core of our souls upon matters vital to Christianity.” The interests of the faith took precedence over matters of political strategy. Religion was ultimately the determinant of Spurgeon’s politics. Who Should Run the Schools? The same point is evident in the preacher’s attitude to education policy, a central political issue for much of the nineteenth century. Like most Baptists in the 1850s, Spurgeon believed at first that the state should not meddle with education. The provision of schools should be left to private initiative—to individuals, societies, and churches. The young needed to be taught the Christian faith, and the state had no more business to take up the religious instruction of children than it had to undertake the religious instruction of adults through an established church. By the late 1860s, however, population growth was hopelessly outstripping the ability of private initiative to provide for education. Baptists reluctantly accepted that the state must set up the necessary schools. To avoid state interference in religious instruction, however, most Baptists decided that schools must be secular. Christian education should be left to the home and the church. Spurgeon could not stomach this conclusion. In 1870 he presided at a London rally calling for the retention of Bible teaching in state schools. A total severance of church and state in the schools, he argued, was nonsense. “How can religion be eliminated from education,” he asked, “unless it be eliminated from the teacher himself?” Spurgeon judged the welfare of the Christian faith to be at stake, and so he was willing to diverge from the prevailing view in his denomination. And in the end, Spurgeon’s policy was put into practice. The government permitted local school boards to include the Bible in the curriculum. A more drastic divergence took place in 1886. Gladstone, the Liberal leader, proposed in that year that Ireland should be given Home Rule [limited political autonomy]. Agrarian unrest was persistent, and the great majority of Irish Members of Parliament were calling for a separate (though subordinate) legislative body. This alarmed Protestants in Ireland. About 80 percent of the population was Roman Catholic, and so, Protestants feared, the new parliament would discriminate against them. Home Rule, they said, would mean Rome Rule. Spurgeon, who always had a lively sense of the historic gulf separating Catholics from Protestants, agreed with them. “The whole scheme,” he wrote in a private letter, “is as full of dangers and absurdities as if it came from a madman.” Soon the opponents of Home Rule were publicizing Spurgeon’s view and claiming that he had charged Gladstone with madness. Spurgeon’s reputation, it was confidently believed, would sway electors against the Liberal scheme. Although Spurgeon publicly denied supposing Gladstone to be mad, he remained adamantly hostile to Home Rule. That meant separation from the Liberal Party, which Nonconformists generally continued to support. Just as the Down-Grade Controversy divided Spurgeon from his colleagues in the religious sphere, so the Home Rule issue divided him from partners in politics. Dr. David W. Bebbington is senior lecturer in history at University of Stirling in Stirling, Scotland.